Rednal boneyard was in operation from the 1860's to the 1950's. The business moved from the Maesbury boneyard in the 1890,s. It will be noted that there was no road access to the site, which was adjacent to the Great Western Railway track at Rednal. All goods delivered would have come and gone by canal barge. Animal carcases would have been brought from far and wide even as far as Liverpool. They were boiled and stripped of fat and tissue which was then reloaded onto barges and taken to Port Sunlight in the Wirral to be made into soap. According to an elderly local resident, the works was also used during the war to manufacture gunpowder.. Richard Hamlett of Heath Houses, Rednal used to work at the bone yard after the second World War, as did his father before him. Diagram of the Rednal boneyard in 1861 showing the sidings coming down from the Great Western Railway with a small building at the junction of the "cut" and the Montgomery canal.It would also appear to show a possible tramway leading alongside the "cut". 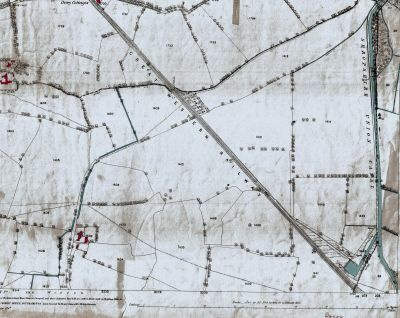 The two rail lines alongside the "cut " are not shown on the 1875 OS map shown below nor are the buildings. It is interesting to note that the factory later became a superphosphates factory. Source Edward Wilson Author of the Ellesmere and Llangollen Canal. 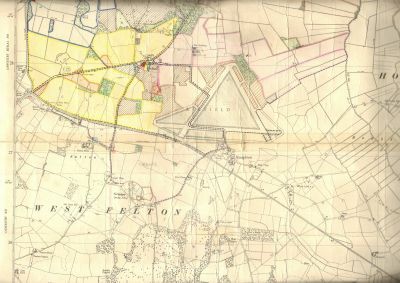 1875 map showing the site of the rednal boneyard. This shows that there was no buildings on the site at this time, the boneyard not moving from the Maesbury site until the 1890's. 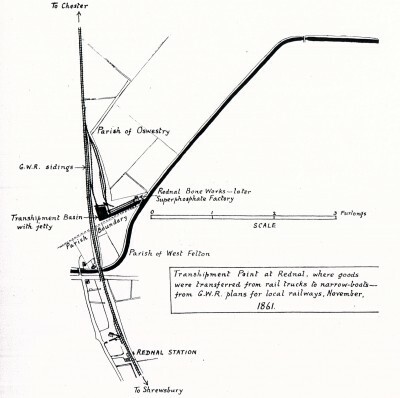 Note that this map shows that there was a siding coming from the main line Great Western Railway going to the side of the canal basin, with a turntable device on the corner leading alongside the north/west side of the basin. 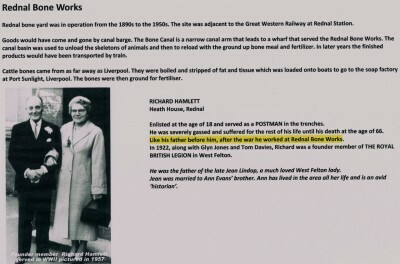 This shows that goods could have been brought by rail to the canal or goods from the canal being loaded onto railway rolling stock. 1926 map showing all the buildings on the boneyard site. Note that the rails coming down from the main line had by this time been removed . 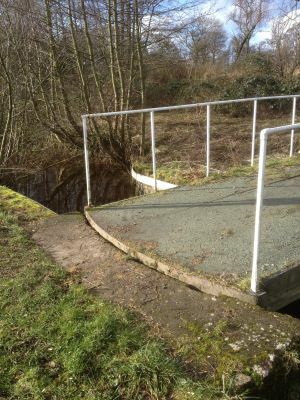 Also the footbridge going from the main building over the 'cut'. 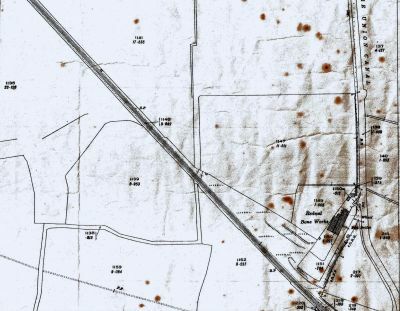 1940's 6" map showing the Rednal bone yard (far left) with the Rednal and West Felton railway station, with Rednal Airfield nearby. 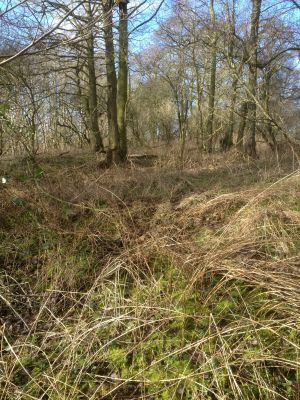 Recent photo (February 2014) taken of the site of the former Rednal Bone works..Now heavily overgrown. Canal basin on the side of the bone yard site. This would have been used to unload the skeletons of the animals and then to reload with the ground up bone meal and fertilizer. 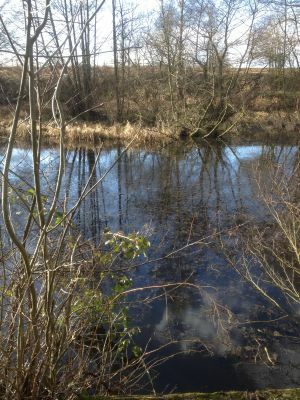 This whole site is now believed to be in the ownership and the Canal and River Trust. 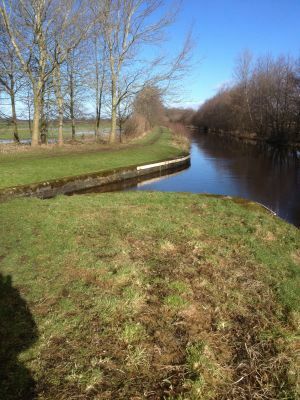 Entrance from the Montgomery Canal leading down the cut to the Bone yard basin. 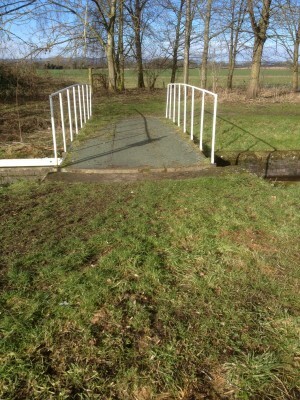 Swing bridge at the entrance of the cut leading to the bone yard basin. Photo of the swing bridge which was installed in the 1880s with tramrails in the bridge.